The Rob Koranda Cup will be on the line at Princeton this Saturday at 1pm at Princeton's home pitch West Windsor Fields. Princeton fully expects a huge challenge. Yale Rugby, under the leadership and coaching of Jan Pikul, has become a serious threat to both Dartmouth and Harvard for the upcoming Ivy crown. The Rob Koranda Cup is awarded to the winner of the annual Princeton vs. Yale rugby match. Princeton vs. Yale rugby dates back to the beginnings of both Ivy League programs. After years of only a chance meeting at the Ivies, Yale and Princeton men scheduled a match in the spring of 2002. By reestablishing the tradition in 2002, the Princeton vs. Yale contest has become an annual event. 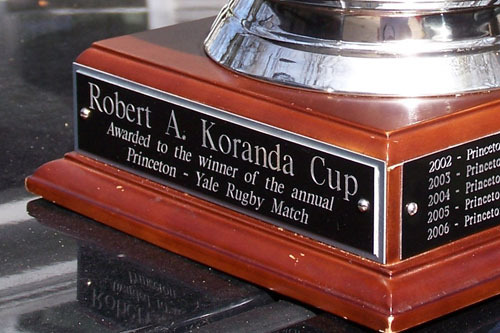 Following the 2002, Yale graciously accepted Princeton's request to make the match special for both teams by creating a trophy in memory of Rob Koranda, one of Princeton’s greatest rugby players. Rob died in the Chicago porch collapse in June 2003, a tragedy that claimed 12 other young lives. He was a very talented flanker, and played on the Princeton team that in 2000 reached the USA National Division 1 Round of 16. Yale is the current holder of the Cup having beaten Princeton 29-19 at Yale in 2007. Previous to that, Princeton won the original contest and had consistently defended the trophy.